......More apologies for not updating the site recently. I could list here many reasons why i've not been able to complete some more tasks recently, but that would make boring reading. The main reason however would be the energy that moving into this place has taken out of me. It has all been worth it though as the peace & quiet here is something else! I am currently writing from the new abode, again with illness (Man Flu). That means time of work, & a chance to update this! On refelction it looks like i have spent half of the year in some sort of discomfort. What a waste! So 2008 will have to be better!. The main cause of injurues = 5-a-side football, so that means i've obviously passed my peak & need to retire from the beautiful game! On the plus side, i've never been fitter than i am now, & my weight/diet is under stricter control than ever before! I've had many emails from 'fans'? of the site, & it's been an inspiring pleasure reading these; I always try & respond where possible, so please keep the comments coming (Good & Bad). The site also got a mention on a popular blog in Italy. Grazia.blog.it I tried to translate the site using the google translate service, but it made no sense to me. If anyone knows of the site, or can translate Italian into 'proper' English or indeed know of the blogger, please drop me a line! 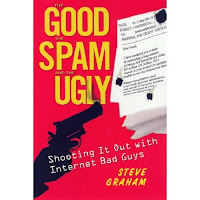 I am getting loads of spam mail, not sure if that means i'm popular (likely), or i have been a little lazy in my filtering of such trash (unlikely)? Available at all good bookstores. & Amazon.com i'm told. The 'Secret Website' Task continues to baffle all. If the truth be known, it hasn't quite worked out as expected, so plans are afoot to replace this back to a completely different task that was part of the original '40'. As alway's if you want to know where the website is email me (no Spam eh!) & i'll send you the link. Remember how I waffled on abouth the Wispa bar coming back to our shelves? (Wispa Blog) Well, they finally came out in October but it took me ages to finally source one locally. In November i got to taste one again having found them in a local newsagent. Brilliant. Had about ten of them since, but now i'm bored. I had a "Top 10 Crisps" (Crisp Blog) blog where i told you all of my top 10 crisps of all time. Well i'm sad to say that No.10 in the list, the Pom Bear crisps have cheated us. Slightly. There are less crisps in the packets now. Approx 30% less. My kids are quite upset by this. So am I. In August's blog i mentioned Justin's site one red drawing pin & his ambition to trade up from a red drawing pin to something much more useful. Well it seems he hasn't progressed very well. Not well at all. Done nothing. But it transpires the idea isn't that unique. Searching round the web, it seems there are quite a few similar themed sites. Looks like we're all out of unique idea's these days! 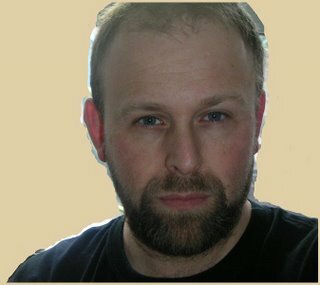 Talking of which - John Boileau, the main inspiration of the Before40 website has vanished! - He hasn't updated his thoroughly enjoyable beforethirty website for what seems a lifetime. Let's hope he's well & that we get an update soon. Email me if you know his whereabouts? It's been a pleasure. Be safe this Xmas & see you in 2008 somewhere! 1. - Marmite Crisps - Walkers got it spot on when they relaunched this popular crisp. After many years of doom & gloom, crispoholics everywhere rejoyced when supermarkets started re-stocking this ulitmate crisp flavour snack. Marmite - "You'll ever love it or hate it" as the advert says. I love it and for me this is THE ultimate bags of crisps. If only they would stock them in Waitrose or Somerfield too! 2. - Cheese & Onion Ringo's - A Childhood favourite, this "Low Calorie!" snack also disappeared from shelves for a while, but was welcomed back in the late 90's. Great shape & texture & a real oniony taste. A real plus was that Ringo's then & now always cost less than a normal pack of crisps. How great is that! The low calorie factor also meant you could eat twice as many! Unfortuately, Golden Wonder never launched the multipack version second time around. Shame. 3. 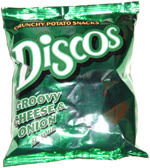 - Cheese & Onion Disco's - Yet another childhood favourite that seemed to disappear from the shelves from the late 80's to late 90's. A real crisp crunch was the added bonus of the Disco crisp sensation, along with the perfect cheese & onion taste. I seem to recall some real tacky adverts that were used to promote these crisps in the early 80's. (Must look out for those on YouTube). 4. - B.B.Q. Beef Hula Hoops - A strange choice for a vegetarian you might think, but thanks to MSG & flavourings there is not one ounce of beef in these hoops. My earliest memory of these crisps was aged 9, & with a fasciantion with all things hula hoop so great i wrote a letter to KP expressing my complete & utter happiness in this new flavoured Hula Hoop. The result? - KP wrote back enclosing loads & loads of vouchers for free bags of the same! - Heaven! 5. - McCoy's Cheddar & Onion - WARNING! - These crisps make you fat! - This packet of crisps has the highest calorie & fat content on this list, but who cares when they taste so good!. This is not helped by the fact that there always seems to be an offer on at the supermarket for these crisps! - either 'Buy One Get One Free' Multipack or '12 for the price of 6' multipack. So faced with that choice, you're always going to select these at your shopping trip "Crisp Choice" time. The ultimate cheese & onion crisp in my opinion. 6. 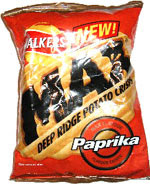 - Walkers Max Paprika - First got into the Paprika thing via the launch of Paprika flavoured Pringles. I'd never eaten Paprika knowingly until that point. So the 'Safe Spice' taste of Paprika married with my fascination of all things 'ridged' makes this crisp the perfect answer when in need of a crisp spice sensation. Quite hard to find these on the shelves nowadays, but fortunately there are many other alternative Paprika options. 7. 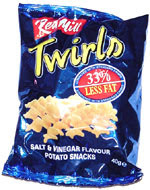 - Salt & Vinegar Twirls -Available at petrol stations everywhere, this twirly snack became a favouite of mine during my years in sales when i would refuel my 'rep car' on a weekly basis. Great value snack (Almost twice the quantity of crisps for same price as a standard bag), low calorie & a great vinegary taste. 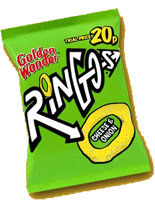 Also available in this value range from Redwood are "Onion Rings" - omitted from this list due to strength of other brands crisps. 8. - Cheese & Onion Square Crisps - I guess the novelty factor of being 'Square' as opposed to standard potato shape made these crisps a success. In my mind the bag & it's content always seemed small, so for me one bag was never enough. Still, these are available in Multipacks, so not really a problem. A great crunchy crisp, old favourite & more cheesy than oniony. The ready salted version of these were my mum's favouite crisp of all time. 9. - Cheesy Wotsits - A kids favourite, and no doubt a favourite for chesse lovers everywhere. It's the crisp we all grew up with, & is like an old reliable friend. Probably one of the most famous crisps alongside standard ready salted, cheese & onion & salt & Vinegar potato crisps. Again, very light on the stomach so more than one bag is never enough. Fun thing you can to do with Wotsits? 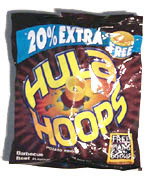 - combine them with Hula Hoops! feeding the wotsit through the hole in the Hula Hoop - Crisp Heaven! 10 - Cheese Quavers - Always popular & always on special offer in supermarkets. A good value, nice reliable cheesey snack that never fails to satisfy cheese desires. Very low calorie, & light. For me that means that 3 packets of quavers equates to a normal crisp fix. Fun alternative to crunching is to let the quaver dissolve in your mouth. Walkers experimented with alternative flavours for a while but nothing ever exceeded the original & best. And For the Children of the new generation? Pom Bear Crisps - Great light & fluffy snack that i steal from my children all the tme. Ready Salted is probably the most healthy option, but look out for the rare Tomato Ketchup version also. They also come in a "Grab" bag size which is brilliant for parents! - There is also multipacks of all varities. One for the future! Just over a month to go until the London to Brighton Bike Ride 2007, & as i seem to get regular requests on training, preparation, sponsorship, well wishes etc. 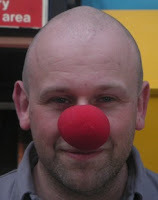 for the big day i thought i'd try & answer most questions here via my blog. So to summarise, i am rider 09995 out of 27,000. The big day is Sunday 17th June. I have been 'Fortunate' in getting a 07:00 hrs start. I say fortunate as from reading reviews of previous years events if you start any later than 08:00 hrs, the time it takes to complete the course can double due to crowding & accidents. So if all goes to plan i should be able to get away 1 hour after the official start time. Training for the day has been going well. It all began back in October 2006 when i bought a new racing bike more suitable for the occasion. Now I have nothing against mountain bikes, but let's face it, they're designed for going down mountains; not 54 miles of tarmac on a hot summer's day. So my first tip would be - get a decent road bike! (Try ebay for a good second hand bargain). 1. Safety (All left hand turns, quiet roads). 2. So that i can track & compare times to see improvement in fitness. I have managed to get round this route in 1 hr 30, knocking 17 minutes off the time of my first attempt 5 months earlier. Great thing about the route is the amount of steep hills. Good practice for Ditchling Beacon, the nasty 1 mile steep hill just before the end of the ride. As of May 2007, I have now extended this route to 30 miles, on my quest to get fitter & go faster!. I try also now to do two cycle training runs in a week, totaling 55 miles. Damn hard work but i am sensing a real benefit now to fitness & health levels & reduction of my beloved beer belly (lost a stone in weight since Christmas). On top of this i play five-a-side footy once a week just to top up the stamina levels. So to summarise, tip two = practice at least twice a week, doubling your route at weekends when you are likely to have more time available. Also try to eat sensibly from now (less weight = more speed! ), and cut down on the booze (it dehydrates you). All easier to write here than to actually carry out me thinks. So what other things do you need to remember? Well, if you haven't actually applied to take part for the 2007 event, it's probably too late. (Check Here to check on the BHF website). You may be able to buy an entry on ebay? Bike Service - Make sure your bike is in good health. Your local bike shop should be able to give it a good service under £20.00. What to take? - Assuming it's going to be a warm hot day, remember sun block, Safety helmet, Shorts, fluids, energy bars, iPod, camera, phone & cash (just in case!). A spare inner-tube & pump is recommended, but i understand there are plenty of repair points around the course. If you havn't trained much, go to Asda or Halfords & buy a Gel saddle / saddle cover to stop your botty getting too sore! How to get there? - tricky one this. If you live in London, you're sorted. Outside of London things are tricky. On the day, local trains will not allow cycles on board. The organisers lay on lorries to take you & your bike back to the start line at Clapham (if you drive to Brighton for you car to be there for you at the finish). Me? - well, due to the early start i had a logistical nightmare to plan this one. However, I have been fortunate enough to secure a room close to the start line at Clapham Common for £40.00 B&B (Not sure if i'll take the breaky in though). So my bike & i will take the train to Waterloo the day before, and as a bonus i won't need to wake any earlier than probably 06:00hrs. My partner will then drive to Brighton on the day to meet some friends, & all being well pick me up at lunchtime & drive me home!. Drink lots of water (& eat sensibly the night before - Pasta is good apparently). & above all cycle safely & really just enjoy it! - I have set myself a target time of 4 hours. I am taking it seriously. Others, (rightly so) make it a fun day & take upto 9 hours! 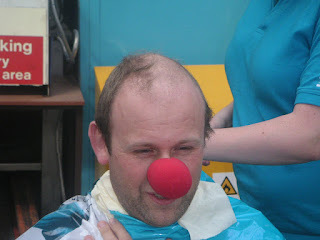 It's for Charity after all!!!! 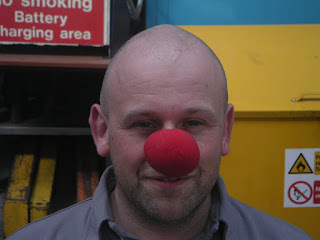 Keep checking back here as i am going to post some links to other people's blogs with stories of previous years ride's. Other than that, i am looking to do the Action 100 mile London To Bristol bike ride in August!!!! Go to google maps & click on the "Get Directions" Link. Press "GET DIRECTIONS" & scroll done to LINE 24 of the "Directions". Try it? (the link silly, as swimming or driving across the Atlantic ocean is not recommended). DISCLAIMER - No responsibility can be taken by Before40 if you are mad enough to attempt to swim the Atlantic ocean on the back of this blog, let alone in 3,462 minutes (57.7 hrs, 2.4 days). 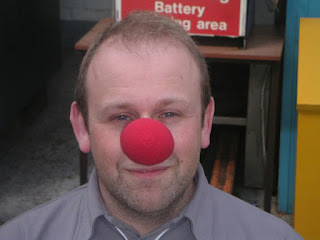 If you do manage it however, let me know & i will gve you a mention on this blog. 7 weeks on from what i thought was a cold, & here i sit, still suffering from laryngitis. A sore throat that won't go away. The doctor has now prescribed penicillin, but still no better. On the plus side, i am back in training for the London To Brighton Bike Ride after a six week break due to the illness, so i guess i'm on the mend. Due to the illness i have delayed the back wax task & the colonic irrigation task, but will try & get these done by early May. 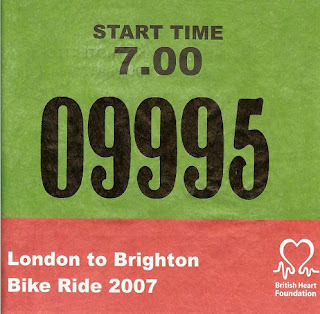 Then it's time to 'up' the cycling to get fit for the "L2B 2007". The plan is to put in at least 50 miles each week, up from the current 25. (Think of the London To Brighton bike ride as the "London Marathon" for cyclists!!). 5-a-side footy has begun again as well on a Monday. I hope that the illness, cycling & footy combined will kick in the "Loose some weight" task. A reply from TGI Fridays re: my Disaster visit to their Fareham Resturant. (Will post it here soon). Over 200 "Friends" now on the Before 40 MySpace site.